Living in Florida, we are very lucky to have a selection of tropical fruits available year round including mangoes, passion fruit, papaya, and avocados. Yes, the avocado is considered a fruit which may be a fact that surprises many folks. I do try and incorporate these delicious fruits into our diet as often as I can, particularly avocados. Although high in fact and calories, the fat found in an avocado is a healthy fat, and avocados provide nearly 20 essential nutrients, including fiber, potassium, Vitamin E, B-vitamins and folic acid. They also act as a “nutrient booster” by enabling the body to absorb more fat-soluble nutrients, such as alpha and beta-carotene and lutein, in foods that are eaten with the fruit. The avocado is virtually the only fruit that has monounsaturated fat, and according to the American Heart Association, good fats are those that can lower bad cholesterol levels and are beneficial when consumed in moderation. I make some type of guacamole, or avocado dip almost weekly and we enjoy it spooned on top of scrambled eggs, as a spread on a veggie burger or wrap, or simply as a snack served with whole grain chips. 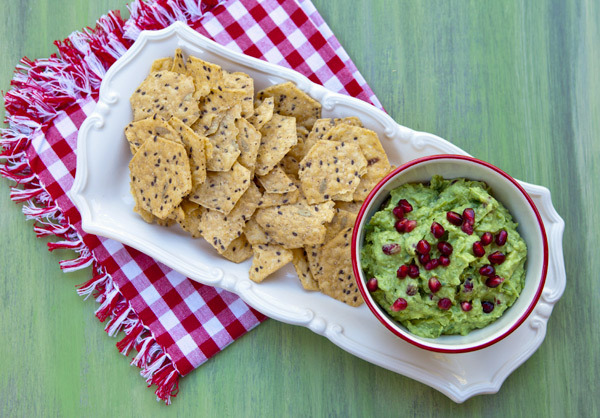 I recently made this guacamole that would be perfect to serve over the holidays. 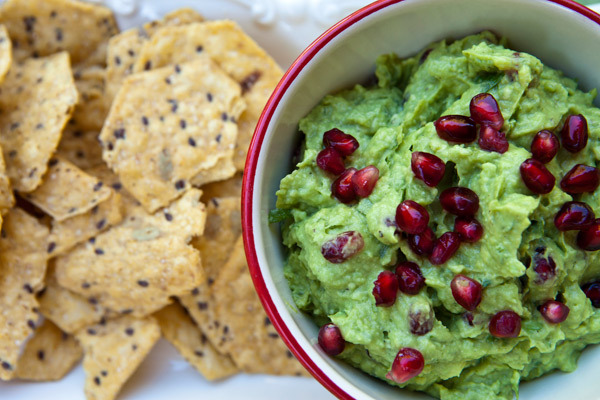 The addition of pomegranate arils adds a little sweetness as well as texture to the guacamole, and the combination of green and red colors is perfect for Christmas entertaining. I like my guacamole a little chunky, so I prefer to simply mash my avocados with a potato masher or fork, but if you prefer your guacamole creamy smooth, you can simply make it in a blender. In this version, I added diced onion, jalapeño pepper, chopped cilantro, pomegranate arils, salt, pepper, and lots of lime to my mashed avocados, and garnished it with added pomegranate arils. Cut avocados in half, remove seed, and scoop out flesh from the peel, put in a mixing bowl. Using a fork, mash the avocado, then add the chopped onion, cilantro, lime, salt and pepper and mash some more. Add half the minced pepper, mix and taste. If needed, add the rest of the hot pepper. Keep the pomegranate arils separate until ready to serve. 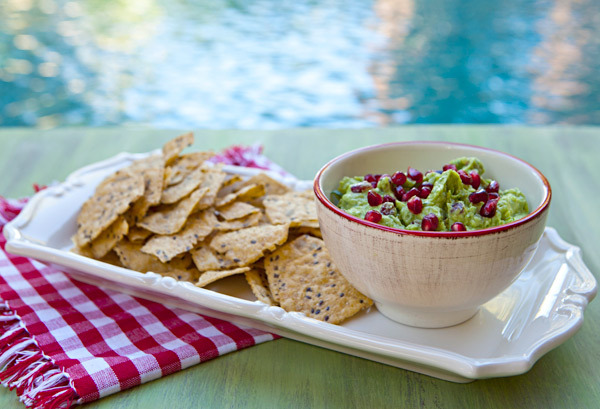 Cover with plastic wrap directly on the surface of the guacamole to prevent oxidation from the air reaching it, and refrigerate until ready. Just before serving, add the arils, and stir. Garnish with extra arils and serve with whole grain chips.